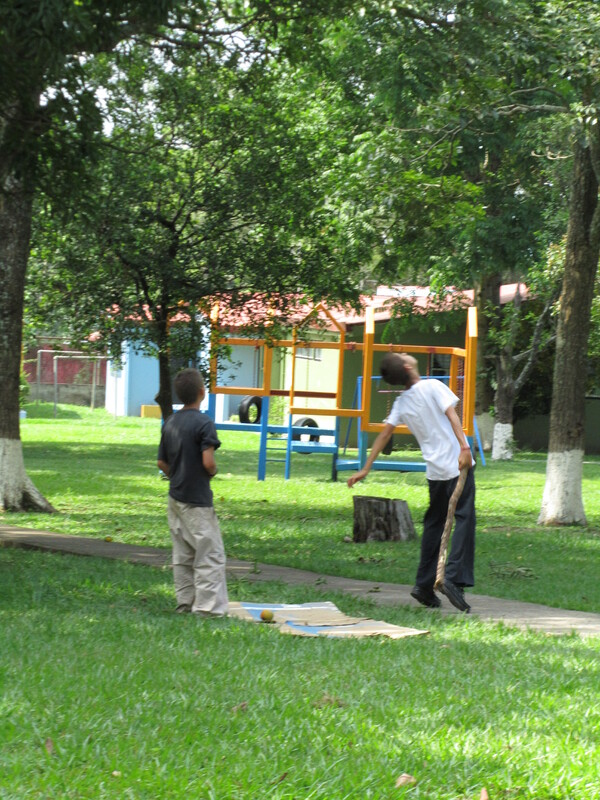 There is an activity here at the aldea in Costa Rica that is a novelty to me. The daily (sometimes tri-daily) mango hunt. It appears I have arrived to sunny Costa Rica just in time for mango season. I love mangos… or at least I thought that I did. That was until I became witness to the vest and fervor with which these kids of all ages hunt and subsequently eat mangos. As Maura mentioned “you don’t have to worry about them going hungry, that is nice.” Yes it is nice, they have ’round the clock snacks… if they are savvy enough to get them. 1. “Easter egg style”– this is where you just walk around and look for them in the grass. And there are tons. The risk in this method lies in the fact that the vast majority are malo (bad). The are either obviously bad and smushed with bugs flying all around them. Or, what I consider to be the scarier alternative, surprisingly bad. 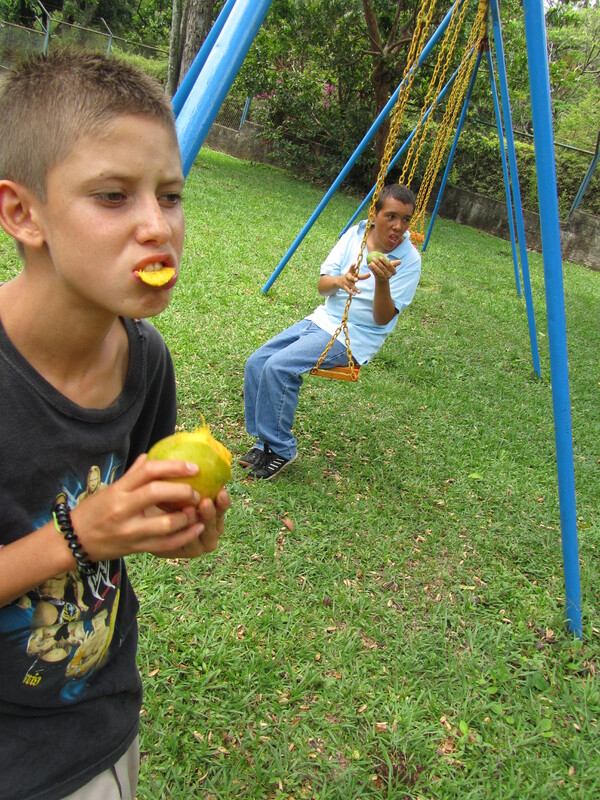 I have been witness to a few kids who have sunk there teeth into a “ground mango” and immediately spit and made a huge scene– bad mango. This is typically the method adopted by the littlest ones, or at least the less coordinated ones. Because at a certain level you move on to advanced hunting. Method 2: The chuck– basically you find whatever you can lying around. 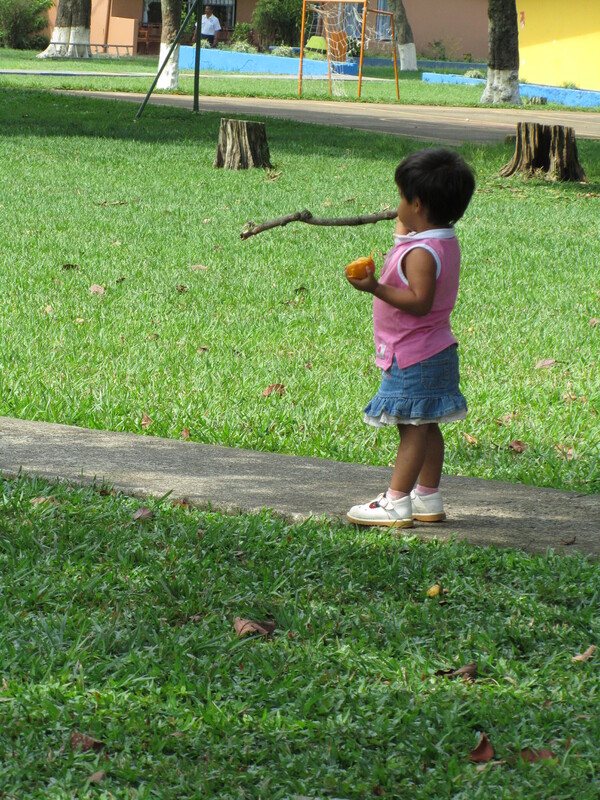 This may be another mango, a soccer ball, or a huge stick etc. It seems to me they like using the big sticks… that way they can adopt kind of a sidearm sling thing. And these kids can pick out a target like nothing I have ever seen before. 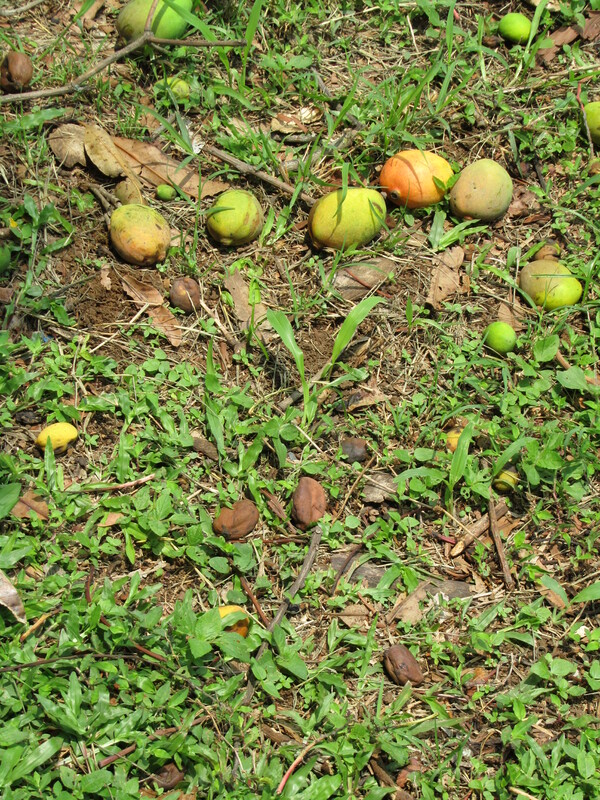 I will be walking through park area with on (personally not paying any attention to the trees) and the kid will stop me, point and tell me “look, there is a ripe mango” and after they describe exactly where it is to my non-mango-hunting-eyes, I see it. There it is, gleaming in the sun… amongst the other 30 that are around it, not quite yet ripe. Kind of like this. 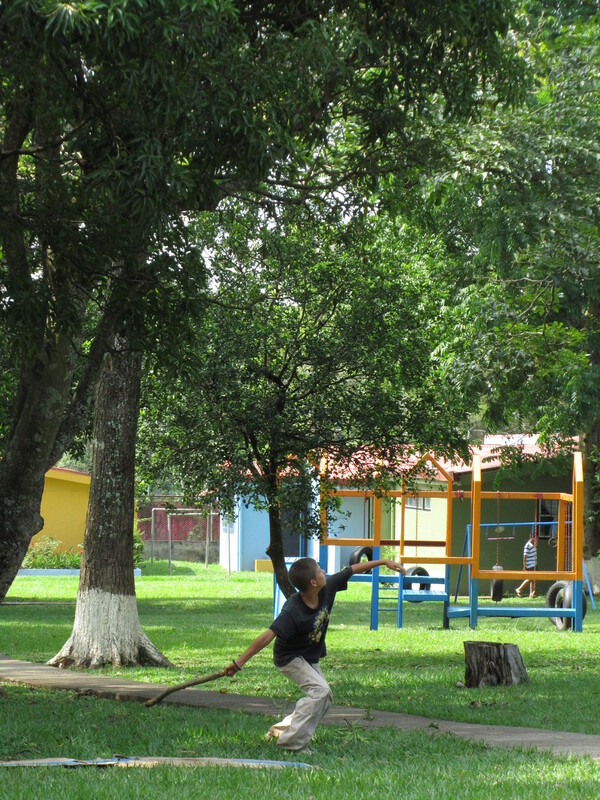 Once the target is elected it is not uncommon to see three or four kids throwing said gigantic branches into trees. Shockingly, I have only seen one injury to date as one little boy had a stick drop from the sky and land on his head. I was nervous… but its been a week and he told me today that his head has totally healed (and sure enough, the knot that I had seen a week earlier was almost gone). Even the little ones understand the thrill of the hunt. Method 3: The climb–This for me seems to me to be the most “skilled” method. As there are only about 3 or 4 teenage boys who I have ever seen attempt it. Yep, you guessed it. They scale the trees… and I mean high. This is also the one method that seems to be forbidden, a punishable act here in the aldea. But every now and then when they think no one is looking (or maybe no one is looking) you can spot someone up in the tree. I am not joking when I say this is the absolute number on activity right now. And it is what is on everyone’s mind… especially those that tend to perseverate on things. Sometimes the promise of a mango following a job well done is the only way that we get through a hard therapy session. 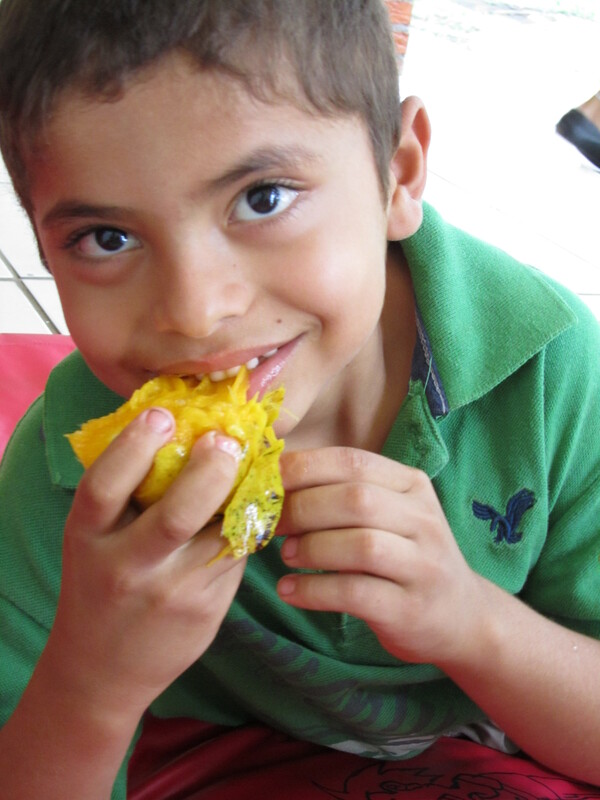 But perhaps my most favorite mango story to date surrounds on of my most favorite kids here. I say kid, but he is actually on of the older teenagers in the aldea. He is 17-years-old… but is more like an adorable, loving, sweet, funny 5-year-old in a 17-year-old body. We were working with him last week and he could not get mangos off his brain. He just kept talking about them, honestly every 30 seconds he would bring up mangos again… no matter how hard we tried to change the subject. 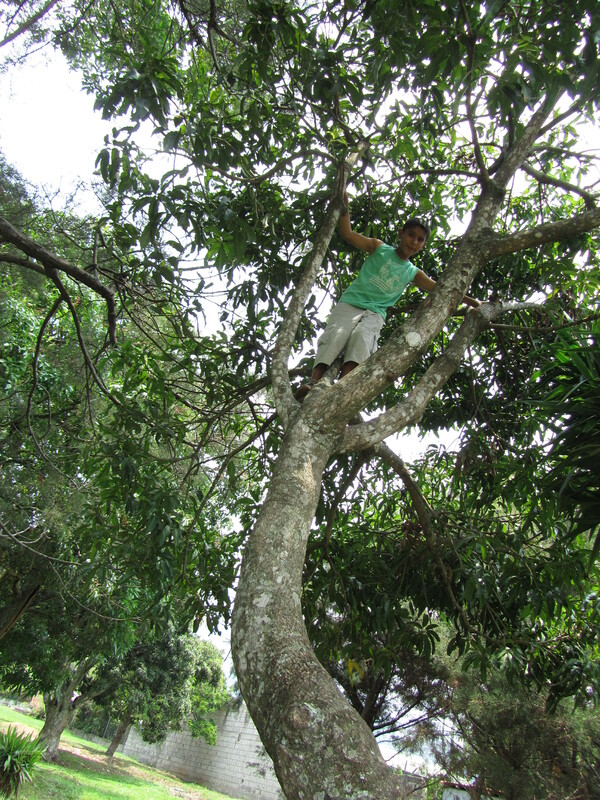 His main obsession was the fact that he wanted to “climb the tree to get that mango”. 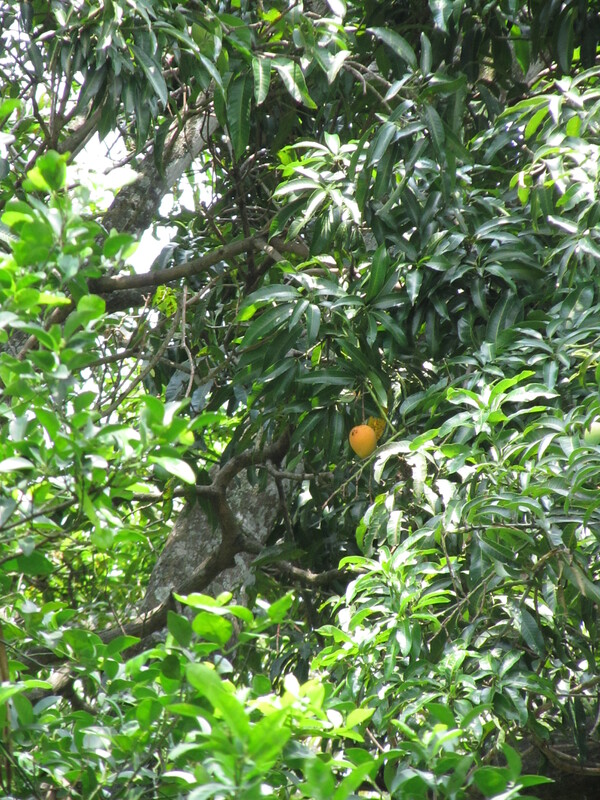 Like I said, he was talking about the one ripe mango that he some how spotted in the tree. On mango that was literally 50 feet off the ground. And he is not a tree climber. But he talked about that mango. About how if we would just let him get up from the table he would climb that tree and get that mango…. and don’t worry he said, he would come right back. There was not a shadow of a doubt in this child’s mind. That mango was his… if we would just get out-of-the-way. He was certain. That kind of certainty, to me, really is kind of beautiful. From my (oh so mature) adult eyes, I knew it was an utter and complete impossibility that he could even get 5 feet of the ground in that tree. For me it was all about the doubt. For him, the sure success and capability. Well, we finally finished. And he marched right up to that tree. Grabbed a hold with two hands, and dug his toe in. Hopped up on the other foot to houst himself up. Attempt 1- no go. 2,3. Then he turned to me, did this adorable little giggle thing that he does. Shook his head and said “nope” and of he went. Never mentioning the mango again. Dang I love these kids.